John Duncan enjoyed a prolific career as a scheming, powerful forward, averaging around a goal every couple of games in English football. Mysteriously, he was overlooked on the international stage, his only representative honour coming with the Scottish League XI while at Dundee. Towards the end of his playing career he moved into management, but was treated unfairly from the start. He built a competitive Scunthorpe side around two central defenders named Baines and Hunter and was on course to seal promotion in 1982-3 when he was sacked. The only reason for it was so that the chairman could appoint an old mate, Allan Clarke, to the job. Under Clarke the Iron got up – just – but came straight back down again. Duncan, meanwhile, licked his wounds during a period at Hartlepool where he worked without a contract but improved them, nevertheless. In the summer of 1983 he was chosen ahead of Colin Addison and Emlyn Hughes to take over at rock-bottom Chesterfield. He must have been mad to come here: the club had just been taken over in the wake of a hugely damaging financial crisis and had only seven players on its books. His first season was one of experiment, as a succession of lower-division journeymen and young hopefuls was permed to see if they had anything to offer. He knew how to get a side out of the basement – his time at Scunthorpe proved that – and it was just a question of finding the right men; Duncan went about the task of finding them with an understated confidence that rubbed off on those around him..
Steve Baines was an early signing; the elegant, powerful pivot was reunited with the rugged and courageous Les Hunter halfway through 1983-4. The versatile Brian Scrimgeour came down from Dundee and Bob Newton came home shortly after; the nucleus of the 84-5 Championship team was complete. The commanding manner in which the Fourth was won raised expectations that the club would attack the division above with the same results. Only a moment’s analysis would have brought the understanding that that could not be, though, given that the club lacked the financial resources to do more than struggle in the division above. Those that had saved the club were in no mood for any more reckless gambles of the sort that had plunged the club so close to closure, and quite right, too. More damaging was a series of disruptive and occasionally puerile arguments between factions in the boardroom that might easily have led to the installation of a revolving door on the place, and threatened to shove the club back into financial uncertainty. Against this background, Duncan kept the club in Division Three, as was, but only just. Three straight wins actually put the Spireites on top of the league in august, but “anything other than relegation” was the realistic target. In the end, stopping up was some achievement. With no money to spend, trust was placed in youth, and the likes of Jamie Hewitt and Bob Bloomer emerged from the junior sides. Gary Bellamy matured into a player of great class and the likes of Mick Henderson, Jim Brown and Ernie Moss used their experience to hold the thing together. Having been a leading Division One side through the seventies, Ipswich Town were relegated from the top flight in 1986. Patrick Cobbold, their Chairman, recognised the scale of Duncan’s achievements and offered him the chance to resurrect the fortunes of his club. Only Teddy Davison and Arthur Cox had ever left Chesterfield to manage a club in a higher division, and Duncan understandably embraced the challenge. Under him they never finished lower than eighth in the second division but were unable to mount a promotion push in the days just before play-offs offered an easy route up, and he left Portman Road three years after taking the job on. Duncan took up teaching at a Suffolk school while continuing football involvement as an occasional scout for old friends within the game. His name was not among those most often whispered when the going began to get too tough for Chris McMenemy, but the Chesterfield board valued his ability to get teams out of the Fourth on a shoestring. 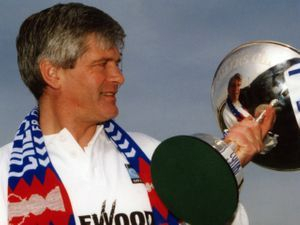 When the Spireites were dumped out of the FA Cup by Macclesfield in November 1992 wheels were put in motion, and John Duncan walked back through the Saltergate front door to commence his second spell in charge on February 17th, 1993. Kevin Randall left his appointment at Mansfield to rejoin him as assistant, with immediate effect. Fans were familiar with what was to come; players were tried and discarded as the management sorted the wheat from the chaff, assembling a side to do a job. The likes of Scott Kopel and Waid Falana came and went before 1992-3 was out and restructuring on a larger scale began that summer. Mick Kennedy – a misfit here, if ever there was one – was paid up, and Dave Lancaster was perhaps unwisely disposed of. Lancaster probably suffered from being tried at centre-half on the day that Mark Jules ripped Chesterfield to shreds, helping his Scarborough to a 3-0 win. Duncan had to rebuild gradually, waiting for McMenemy’s men to see their contracts out. The most significant imports in the summer of 1993 were those of Darren Carr, Mark Jules and Tom Curtis, but two top transfers were completed with the season a couple of months old, when Lawrie Madden joined from Darlington and Nicky Law came in from Rotherham. Jamie Hewitt, freed under McMenemy, returned from Doncaster a more confident, mature and effective player. The side finished eighth, having suffered too many draws to make a worthwhile push for promotion. Andy Beasley and Chris Perkins joined in the summer of 1994 and by December the side occupied 7th place, While the defence was sound, it was put under pressure by a lack of creativity and punch in the midfield. Up front, the willing and richly talented Kevin Davies was not the sort of player to lead an attack. Accordingly, Duncan made two signings of huge importance. Midfielder Phil Robinson was stolen from Huddersfield for £15,000, and Tony Lormor joined on a free from a Lincoln side that thought him injury-prone. Lormor made his debut at Doncaster on Boxing Day. Two Robinson goals won the points. The influence of these two on the side cannot be overstated: Chesterfield went a club-record twenty-one games unbeaten from Lormor's debut and ended up meeting Mansfield in the play-offs. The Stags were seen of after a night of great drama at Saltergate and the anti-climactic final saw Chesterfield coast to a 2-0 win over Bury. Lormor and Robinson, predictably, were the scorers. John Duncan was flung fully-clothed into the dressing room bath, but nothing could dampen his spirits. Referring to the decision to give up a good teaching job to return to management, he said "People say 'Never go back,' but I came back into football and I'm delighted that it has all worked out." Norton Lea and Barrie Hubbard joined the post-match lap of honour. Their decision to bring Duncan and Randall back was fully vindicated. Chesterfield appeared to be moving forward, but fans still found reason for dissatisfaction with team selections, tactical formations and the general style of play. The likes of Billy Mercer, Mark Williams and Paul Holland improved the side and it usually kept in touch with play-off candidates; a fine achievement, given the resources available to the manager. These were stretched thin as money was reserved for the idea of relocating the club to Wheeldon Mill, but 1996-7 saw the fantastic run to the semi-finals of the FA Cup. The signing of Marcus Ebdon pointed towards the side adopting a more cultured approach. Oddly, though, Duncan’s best signings were made when money was tighter and the transfer couldn’t afford to be anything other than 100% right. When the club had a bit of money sloshing about, like after the cup run, signings like those of Steve Wilkinson and Harry Willis came to be regarded as less effective, and the £250,000 purchase of Jason Lee is best forgotten about – although to be fair to Duncan, stories persist that the Chairman bought him against the manager’s wishes. The better players in the Cup team could not progress further with Chesterfield, and moved on to better clubs. Those chosen to replace them were decent enough, but less effective, and an awful 1999-2000 season saw Chesterfield relegated to League Two. Playing-wise, the team returned to an “effective but unattractive” outlook that caused massive discontentment on the terraces since it failed on the first count, this time. New chairman Darren Brown saw the opportunity for instant popularity with the fans and removed Duncan and Randall from office on April 11th, 2000. Kevin Randall immediately took up an appointment on the Academy staff at Sheffield United, but John Duncan looked towards scouting and media work for employment. The two still had a role to play in the future of football in Chesterfield; showing no bitterness about their demise they voted to lose money and accept the CFSS offer for the club in January 2002, allowing the club to move out of administration without falling back into the hands of ex-chairman Norton Lea. Suitably well-attended testimonial matches for the pair were arranged as a mark of appreciation for this, as much as for their fine service over the years.